In this tutorial, you’ll learn two different ways to create 2D animated characters. Typically, when you create or download an animated character, it will come in one of two ways: as individual images or as a single sprite sheet containing all the animation’s frames. Depending on which type of assets you have, you can choose one of the following solutions. First, we’ll use AnimatedSprite to animate a collection of individual images. Then, to use a sprite sheet, we’ll use AnimationPlayer along with the Animation property of Sprite. The root node could also be Area2D or RigidBody2D. The animation will still be made in the same way. Once the animation is completed, you can assign a shape to the CollisionShape2D. See Physics Introduction for more information. 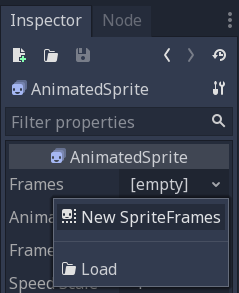 Now select the AnimatedSprite and in its SpriteFrames property, select “New SpriteFrames”. From the FileSystem dock on the left side, drag the 8 individual images into the center part of the SpriteFrames panel. On the left side, change the name of the animation from “default” to “run”. Back in the Inspector, check the box for the Playing property. You should now see the animation playing in the viewport. However, it is a bit slow. To fix this, change the Speed (FPS) setting in the SpriteFrames panel. You can add additional animations by clicking the “New Animation” button and adding additional images. Once the animation is complete, you can control the animation via code using the play() and stop() methods. Here is a brief example to play the animation while the right arrow key is held, and stop it when the key is released. In the event you have a sprite sheet containing all of your animation frames, you can’t easily use AnimatedSprite. Instead, you can use a standard Sprite node to display the texture, and then animate the change from texture to texture with AnimationPlayer. Right-click the image and choose “Save Image As” to download, then copy the image into your project folder. 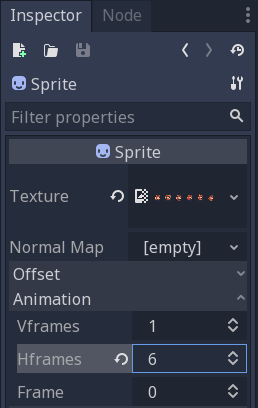 Drag the spritesheet into the Sprite’s Texture property, and you’ll see the whole sheet displayed on the screen. To slice it up into individual frames, expand the Animation section in the Inspector and set the Hframes to 6. Hframes and Vframes are the number of horizontal and vertical frames in your sprite sheet. Now try changing the value of the Frame property. You’ll see that it ranges from 0 to 5 and the image displayed by the Sprite changes accordingly. This is the property we’ll be animating. Select the AnimationPlayer and click the “Animation” button followed by “New”. Name the new animation “walk”. Set the animation length to 0.6 and click the “Loop” button so that our animation will repeat. 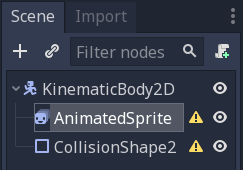 Now select the Sprite node and click the key icon to add a new track. Press “Play” on the animation to see how it looks. These examples illustrate the two most common situations you’ll encounter in 2D animation. Each has its benefits. 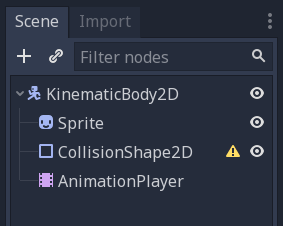 Working with AnimationPlayer is a bit more complex, but provides additional functionality, since you can also animate other properties like position or scale. Experiment and see which works best for your needs. © Copyright 2014-2019, Juan Linietsky, Ariel Manzur and the Godot community (CC-BY 3.0) Revision d4358b59.